The "Risk for Europe" panel discussion will be held Feb. 21 at Webster Vienna. 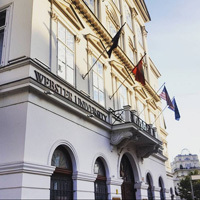 Webster Vienna will host "Risk for Europe – Chance for Europe: Brexit, Euro and Populism," an evening panel discussion on Thursday, Feb. 21. Gone are the optimistic days of the 1990s – today the European Union is pummeled by crises, or so it seems. Eurocrisis, Brexit, and international developments shake the very foundations of this unique project in regional integration. Do we need to re-invent the European project? And if so, how can we move past the current wave of re-awakened nationalism? Can Europe still provide the right answers to the multi-faceted challenges the 21st century has in store? Hors d’oeurves and drinks will be served after the discussion. Space is limited. Please RSVP by Feb. 18, 2019 at office.director@webster.ac.at. Co-hosted by BKS Bank, in cooperation with American Chamber of Commerce in Austria.